Oia is the most beautiful village of Santorini that recently started looking like a glamorous town, every day gathering thousands of people longing for seeing the famous Oia sunsets. If you have time to visit just one place in the island – choose Oia. That’s what you’ve been dreaming of for so many years looking at the pictures of the white churches with bright blue domes. Oia is located 11 km away from Fira and is a pedestrian town. Most of the visitors come here to admire its unique architecture, captains’ houses, Blue Domes, cave houses and the sunset. You can see crowds of people here any time of the day, for it’s a must to see if you are in Santorini. Otherwise you’ll have to come back! Oia is famous for its chic and expensive restaurants and a great shopping, too. The truth is that in this town you can find all the beautiful, quality, expensive and exclusive goods. Santorini is being visited by all the famous and important personalities of the whole world regularly, therefore every expensive world famous brand is presented here. This town hosts an incredible number of hotels, although most of them you do not notice thinking these are just the houses of the locals. The whole place is built along the Cliffside. Do not expect to swim in the sea if you stay here – the beaches are located on a different, flat side of the island. Oia is the only settlement of the island that can boast of a marble avenue crossing its whole length. little coffee shops and small taverns with delicious coffee and meze giving you a feeling you belong here. Everything seems to be so tiny, yet the town spreads out for at least 2 km along Caldera. Doors leading to nowhere; doll houses of white, pink and light blue colors, hiding inside their caves real Greek hospitality. What you consider to be a little house can easily be an expensive villa or a 5* hotel hiding inside a cave pool providing total privacy just for the two of you. We suggest to avoid visiting Oia during summer midday hours. The sun is too hot at that time and the light falls not in a proper way for photos. This town is good to walk around wearing a hat, having with you a bottle of water, a sunscreen and enough space on the memory card of your cameras. When the town has too many visitors, only a private tour guide saves your time, taking you out of the town in the fastest way, away from the central street blocked with people. Remember that all those tiny lanes are planned to be like that on purpose, to confuse the pirates, therefore you can easily lose your way. Panagia Platsani Church (Virgin Mary Platsani) is a cathedral standing on the main square of Oia. Most certainly you will visit it while in town. It was built after the earthquake of 1956 - due to the fatal damage of the original church. Still, it is one of the richest churches in Santorini with many icons, two of which are the miraculous icons of Virgin Mary. You can see lots of “tama” and gifts from everyone whose prayers were heard. Wooden iconostasis attracts special attention. With the shroud of Virgin Mary. Most of the time Panagia Platsani is open for visitors except for the afternoon hours, Sundays and religious holidays. To tell you the truth, you can find the Blue Domes not only in Oia searching for those famous ones that you see in many pictures of Santorini. To see the ones though turn to the first lane on the left going from the main square of Oia towards St. Nicolas Castle. To find your way for sure, we recommend to take a private tour. The remnants of the medieval castle of St. Nicolas can be found on the tip of the cliff at the northern end of the island. You will recognize the Castle from the crowds of tourists as this is the most famous spot to watch the sunset. We wish we could declare we agree that the world’s best sunsets are here, but we know much better places, and more quiet. Would you like to see them? It’s easy to do taking a private tour. The Castle is a perfect point to observe both parts of Oia in their best. The views are so breathtaking that you would not want to go away. Why do you think the whole fence is full of ribbons and locks? This is an excellent spot to take the pictures of the windmills and the Ammoudi bay below with its fantastic emerald-blue waters and the red rocks on the background. If you are lucky, you will see the mules and donkeys walking from Oia downwards. Late in the evening one can visit the castle only using his own torch, but Oia by night looks same exciting or even better! The island of the winds naturally had lots of windmills. During the Turkish occupation the Turks would call Santorini a “Windmill” in their own language. At present time all the food stuff is being brought from the mainland and other islands, therefore no flour making any more, which makes the windmills unnecessary. The ones you see here in their impressive beauty were restored to be used as an attraction. The windmills are located on the “sunset part” of the island and are visible well from the Castle. Big, beautiful mansions of different colors decorated with the red volcanic rock are really impressive. Mostly they can be found in Oia because famous Santorinian captains travelling all the way to Europe and to the Black Sea lived here. International trade made them rich, so they could afford to have the best things in their houses and they would bring rare pieces from different countries. The captains have established their quarters, Sideri, in a flatter part of the town, aside from the Cliff. Still, this did not save them from a strong destructive earthquake of 1956 that caused their damage. Not all the captains’ mansions could be restored after that leaving a memory of an event that changed the lives of the locals and of the whole island. These surprising little houses can be found all over the island, but in Oia you can see them from inside as well, visiting one of the nowadays little shops or choosing a traditional style hotel. A natural disaster of the 17th century BC – a terrible volcanic eruption – gave us a possibility to built bio-houses almost at no expense. A thick layer of pumice covering the island saved poor people from the winds and bad weather providing them with a warm place where water could not penetrate easily. The seamen living in the previous centuries could afford having a house only of that type but the cave houses were the ones that survived the earthquake of 1956 with no damage. Today a cost of such a cave with Caldera view is enormous. In winter though there’s no need of heating inside, while in summer there is a comfortable temperature even without air-conditioning. 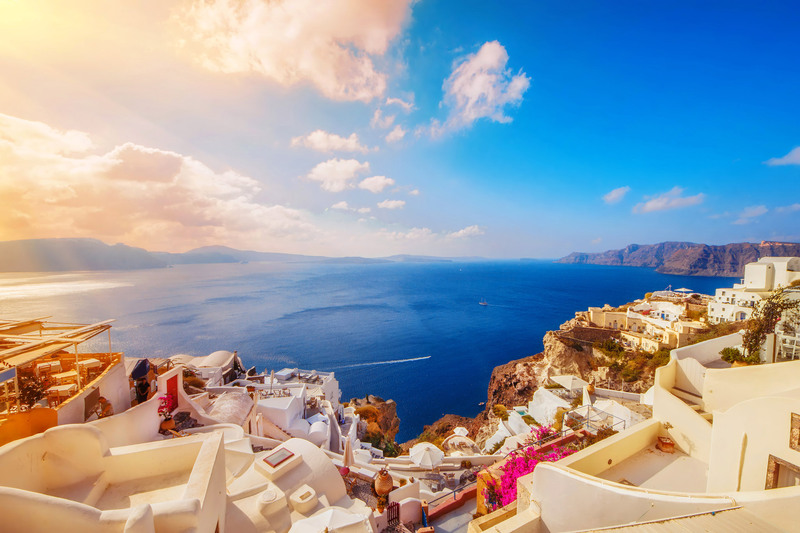 It is commonly believed that Oia has the most tasty homemade ice cream, most romantic restaurants, most expensive and chic hotels and villas while pictures taken in Oia look like cover photos of famous magazines. No doubt that most glamorous people are definitely visiting this jewel of the Aegean Sea. At the beginning of October the Worlds’ Free Runners Championship takes place in Oia when young people are jumping from one roof top to another. The history of Oia starts from medieval period when St. Nicolas Castle was built here to protect the northern part of the island. Back at those days it was just that Castle with no houses outside. For safety reasons locals had to live inside the Castle walls. When the danger was over, in 18th century the population started building ships. In Armeni bay, below Oia, locals established shipyards, and already by the end of the 19th century this village had the 3rd biggest fleet in Greece. Captains of Oia travelling abroad were exporting sweet Vinsanto wine bringing back the goods that could not be found in Santorini. That was the time when the Captains’ Houses appeared. It’s modern name Oia acquired only at the beginning of 20th century. Why and in whose owner? Ask your guide during your private tour to Oia. Many of you know this bay from the movie “The sisterhood in the travelling pants”. From Oia one can go to Ammoudi descending 214 stairs starting right in front of the Castle (Kastro). Same stairs are used by the donkeys and mules. Ammoudi is a charming bay located below Oia and its huge red rocks. From down there the place looks incredible making your lunch or dinner even more pleasant. We go to Ammoudi to eat fresh fish and seafood. The waters here have such a striking color that make the whole landscape quite amazing. Make sure you take your pictures before you go for lunch! Ammoudi is also famous for its sunset which is more impressive than the one visible from the Castle. The good news is that after your lunch or dinner there’s no need of climbing the stairs. There is an outside road leading to Oia, so you can arrange your transfer or call for a taxi from one of the taverns. Usually Ammoudi is full of people in the afternoon, so make sure you have a reservation if you are planning to come during the peak season. Ammoudi is the place of catamarans and boats – they are departing from here to show you the beauty of Santorini from the sea, to pass nearby the Volcano and to swim in our volcanic Hot Springs. You can walk to Armeni from Oia. There is a path which is smoother than the stairs descending to Ammoudi. On the way back one can get a donkey or mule. First we had the shipyards here, later – fish taverns. This port was the one where all the ships coming to Santorini were making their first stop before all the sea “traffic” was moved to our new port of Athinios. Slowly the little port became abandoned. At present time sometimes big tourist “pirate” boats arrive here, while the visitors of Oia during the hottest months are coming down at Armeni in a search of a place to swim. Armeni is not exactly a beach as you may expect, although wearing water shoes you can swim here in its clear waters. Red stones give to the bay its own charm. No sun beds or umbrellas available. A couple of taverns can be open here in summer where you can have a coffee, too, or buy water. As far as Armeni is not a very tourist place, most probably you will be here on your own. We imagine some of you are getting excited reading this article. Have in mind you take your risk coming down here and all responsibility is yours. Red rocks and pumice are not very stable. From time to time there can be a land slide or a rock fall here, although the Cliffside wall is protected with a metal net. Unfortunately, there were a couple of fatal accidents on this path followed by a prohibition to walk up and down to Armeni for safety reasons. Armeni Bay presents one of those places and it was described above. If you like jumping into the water you may try going down to Ammoudi and follow a path on the left side leading from there to a tiny islet with St. Nicolas church on it. The islet can be reached only by boat or swimming. To go to other places nearby Oia you will need a vehicle. The closest beach-like place is Katharos located 1,5 km from Oia. In fact it’s a cape with huge stones and some tiny spots with sand and pebbles, hit by high waves due to the northern winds. Entrance to the sea is rather problematic. Katharos is a wild beach which is not kids friendly. No shade, no sun beds, no umbrellas. On the way to the sea there is a little beach bar. A much better place to swim and the real beach is located on the flat side of Santorini and is called Baxedes. The distance from Oia is about 4 km. Initially this was a wild beach but several years back sun beds and umbrellas made their way here too. More than that, now the beach has changing cabins and a couple of movable canteens where you can get your drinks, snacks and water. Have in mind that the black sand becomes very hot under the bright sun of Santorini. When the wind is blowing from the North, Baxedes is not a good choice as the sea becomes rough and the sand in the air will not let you feel comfortable enough to enjoy your time on the beach. One more thing is the currents that move the sand at the bottom of the sea this or that way creating pits. Have it in mind making your step into the water in order not to fall down. Warn your kids about that beforehand. In Santorini though there are many windless days in summer, which means you will be able to enjoy your swim at Baxedes beach.